New kitchen designs sometime can be a little too cold, too impersonal and stark, but if done right, a new kitchen means that you finally have the chance to add all of the personal touches that you and your family deserve. 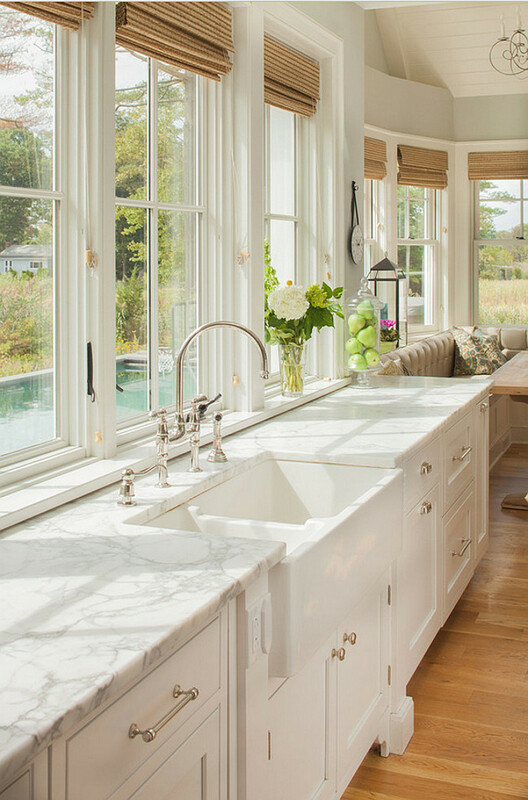 Designed by by Connecticut Stone, this farmhouse kitchen went through a big renovation. New cabinets, counters, backsplash and lighting were installed but the homeowners maintained the original hardwood floors since they were in good condition. 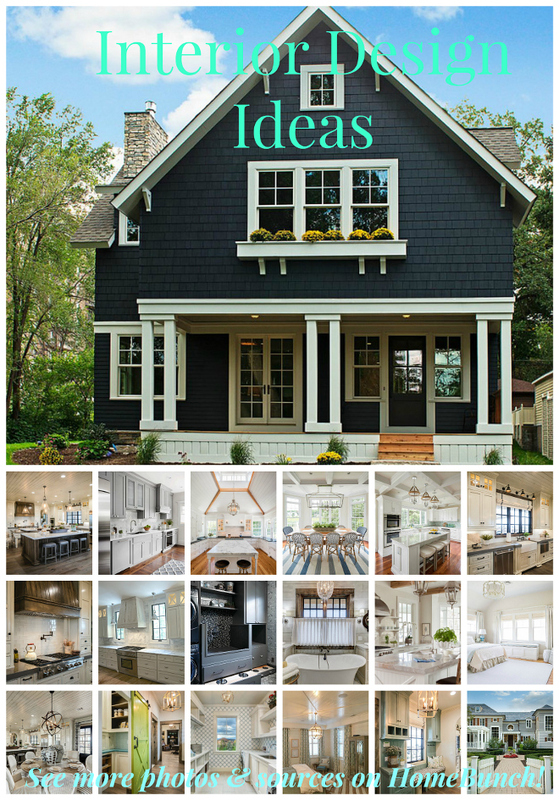 There are so many inspiring things about this farmhouse kitchen, including a charming pizza oven, a custom breakfast nook, plenty of windows for abundant natural light and an overall homey feel.. This is truly a kitchen in which I would love to cook and not just stare and be scared of making a mess. Look at that huge island… wouldn’t you love to make pizza dough and put it in that pizza oven? Imagine cooking here and eating the food in that inviting breakfast nook. How fun would that be! 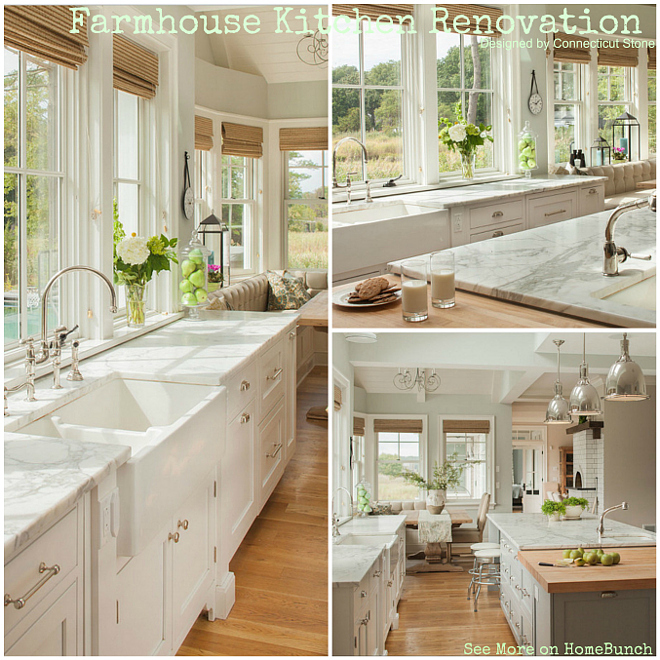 This farmhouse kitchen is not only practical but also enchanting. Take a look at the neutral decor and the country view. Isn’t this beautiful? 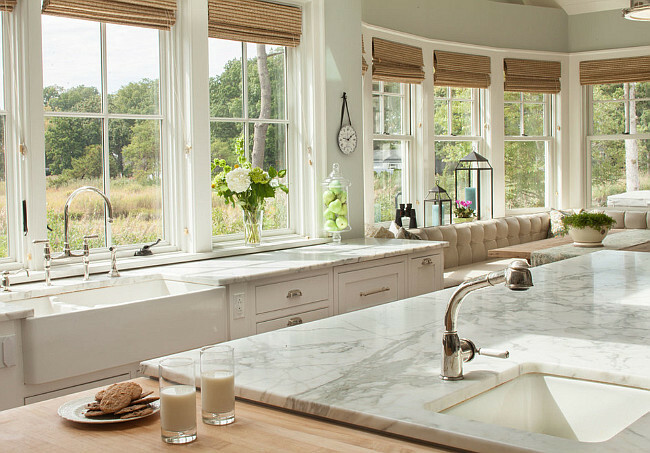 The kitchen island features honed Calacatta Gold and butcher’s block countertop. Great surfaces for the serious cook! Roman Shades: The bamboo roman shades were custom order from Lowe’s. They’re Key Largo from Allen and Roth. I love these! 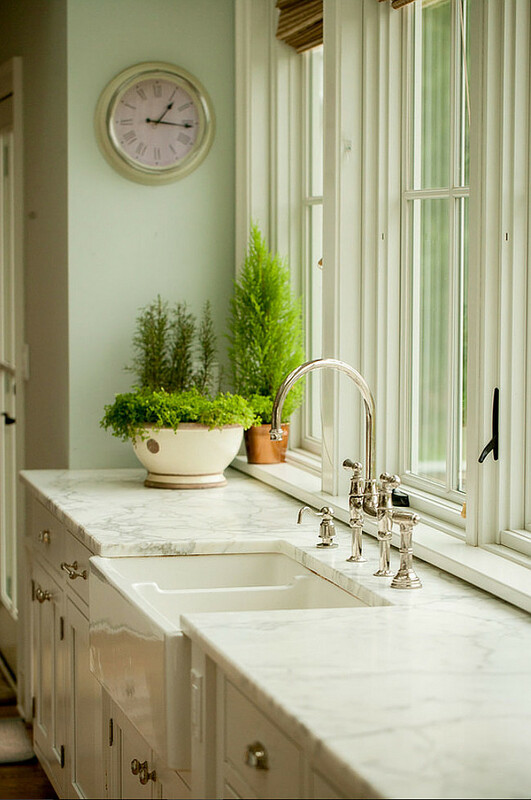 Kitchen farmhouse sink is from Signature Hardware. It is the 39″ wide Risinger double bowl fireclay sink. Kitchen Hardware is Lugarno Polished nickel from Restoration Hardware. The appliance pulls are 8″. Kitchen Paint Color: Benjamin Moore Arctic grey was used in the kitchen and dining nook walls and Benjamin Moore Edgecomb Gray was used in hall into family room. Trim paint color is Benjamin Moore OC-17 White Dove. Kitchen Island Measurements: The island is 10 feet long and 51″ wide. The Boos Block counter is 50″ x 50″. The floors are 5 inch white oak with waterlox sealer. Notice the pizza oven by the breakfast nook. Isn’t it special? My grandmother used to have one in our farm in Brazil and we used to bake homemade bread almost every weekend. Table is the Salvaged wood Trestle extension table from Restoration Hardware 108″. Calacatta Gold Marble was used not only on the kitchen island but also on the perimeter cabinets as well. Calacatta Gold is a classic, timeless marble that I often recommend to my clients. 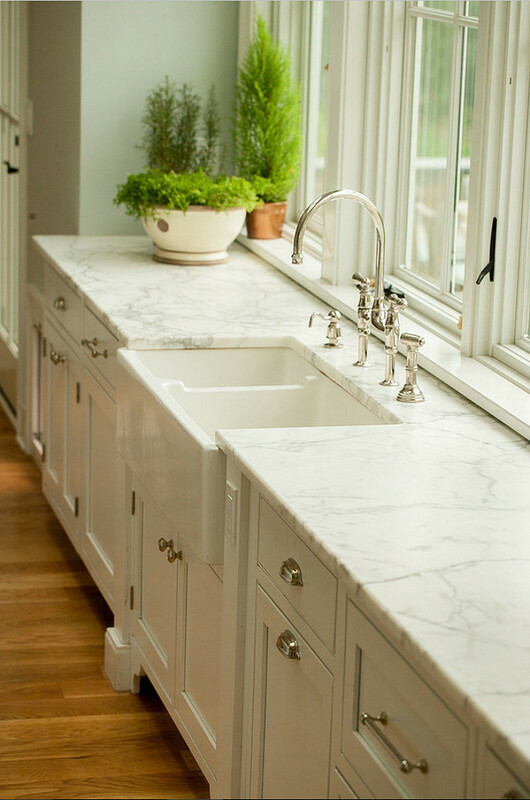 How to Take Care of Your Marble Countertop: Calacatta Gold Marble is a popular choice for kitchen counters but it is important to know that there is maintenance associated with this product when it is used in high traffic areas. Marble in general can etch from acidic foods and beverages such as lemon, wine and vinegar. It’s important to use a top quality sealer but know that, on occasion, a stone restoration specialist will need to remove the etch marks. For maximum durability, one could consider using a synthetic man- made product like Caesarstone, Pental Quartz, Zodiaq or other. These products have color options that look similar to Calacatta but they offer greater durability with regards to etching and staining. Alternatively, if a natural product is preferred, I would consider looking at natural quartzites which are harder than marble. The cabinets are by Greenfield Custom Cabinetry. Door style is Augusta and the outer cabinets are Glacier White color. 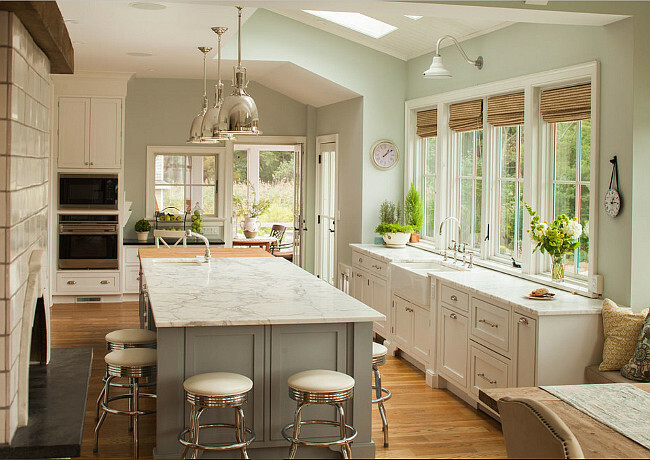 The kitchen island paint color is Eucalyptus. The barn sconce over the kitchen sink is from Barn Light Electric. 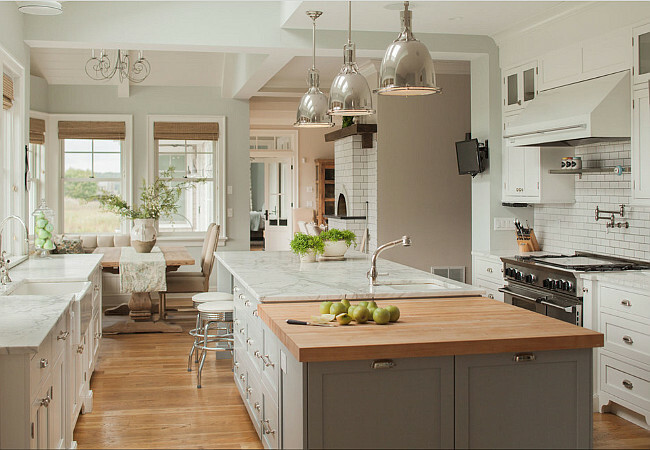 Island pendant lighting are Benson Pendants in Polished Nickel from Restoration Hardware. The counter stools are from William Sonoma Home. They are the 24″ diner stool in cream. Kitchen ovens are by Wolf. The kitchen faucet is Perrin and Rowe Bridge Kitchen Faucet with side spray in Polished Nickel. Yet another timeless choice found in this kitchen. Isn’t this a “pin-worthy” kitchen? Thank you Connecticut Stone, for sharing the details above with us! Monday: Beautiful Homes of Instagram: Christmas Special. How are you today? I hope you enjoyed seeing this beautiful kitchen. What I liked most about this space is how inviting it feels. I love seeing many interior styles but the more I work with home design, the more I can appreciate homeowners that choose to live in spaces that seem to embrace family time. I feel our home should reflect who we are and how we like to live. Creating beautiful interiors is more than following a trend, it should be based on creating spaces to make you and your loved ones want to spend quality time together in the most special place for you — your home. Gorgeous! Such a happy and functional kitchen..hope you are well. Can you please give me details on window shades? Thanks so much! I don’t see a refrigerator–is it in this room, or another adjoining room? What size is your sink base? I am trying to figure out what size sink to order for a 36″ sink base. Thank you. Where did the pizza oven come from ? I love the island color Eucalyptus. Who is the maker of that color?